I vaguely recall that this hanger also had a shelf made of a cross-section of a tree, shellacked to death with little drippy bits of sealant on the bottom of the natural wood. 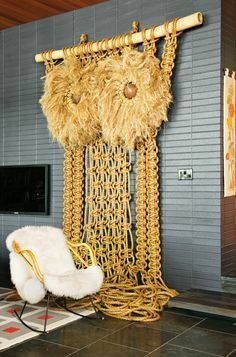 I first started seeing the resurrection of macramé in serious design-y places like Jonathan Adler’s home a few years ago. Image from Pinterest, but it’s from Jonathan Adler’s vacation home. The oversized scale and the retro-ness of it all added up to pure heaven. 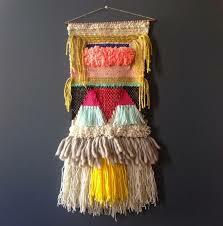 I would love, love, love to have one of these bright, super-scaled macrame works hanging on the wall of Fancy Pants Ranch. 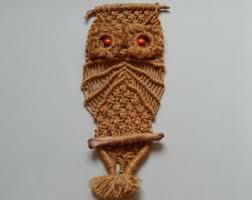 While I’m good at tying knots in the OR, though, I am not certain this skill translates to fiber art. P.S. Here’s a DIY version.